Since 1996 the Anders Wall Foundation has provided scholarships to SSE Riga students who have achieved excellent academic results and participated in different extracurricular activities or entrepreneurship. This year the scholarship of 125,000 SEK was awarded to Year 3 student Danielius Korsakas. The annual Anders Wall Scholarship award ceremony took place in Stockholm on March 9. The Anders Wall Foundation presented in total 2 million SEK in scholarships to eleven young talents in the areas of research, entrepreneurship, rural development, international studies and music. The event was attended by 550 guests. 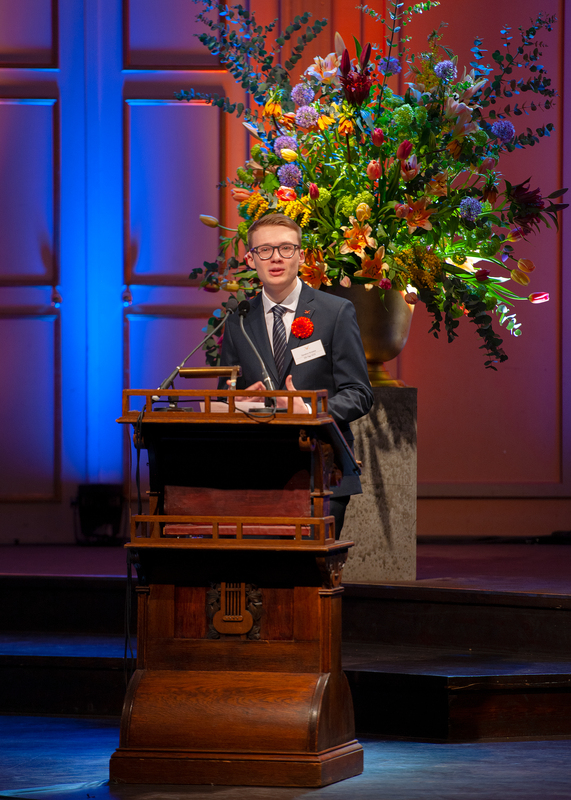 This year SSE Riga student Danielius Korsakas (pictured) was recognized for his business idea – InvesTube – a crowdfunding platform that connects promising YouTube content creators with potential investors. Danielius has also shown a profound interest in entrepreneurship before. He won 2nd place in the Garage48 startup competition in Riga. Danielius has been involved in other extracurricular activities as a member of the SSE Riga Debate Society, a Chief Coordinator for Lithuania for SSE Riga’s “Days of Opportunities” and a teaching assistant for the courses Macroeconomics, Microeconomics and Financial Economics. The Scholarship Selection Committee also recognizes Danielius’s excellent grades at SSE Riga. Every year since 1981 the Anders Wall Foundation has provided scholarships to young talents in the fields of entrepreneurship, science and research, rural development, international studies and music in Sweden and Finland. And since 1996 the Foundation has supported talented students from SSE Riga. What is at least as important as the scholarship amount in monetary terms is membership in the prestigious Wallumni network, which consists of all the former scholarship holders. Members meet regularly and take international study trips together. More information about the scholarship is available at www.wallstiftelsen.se.